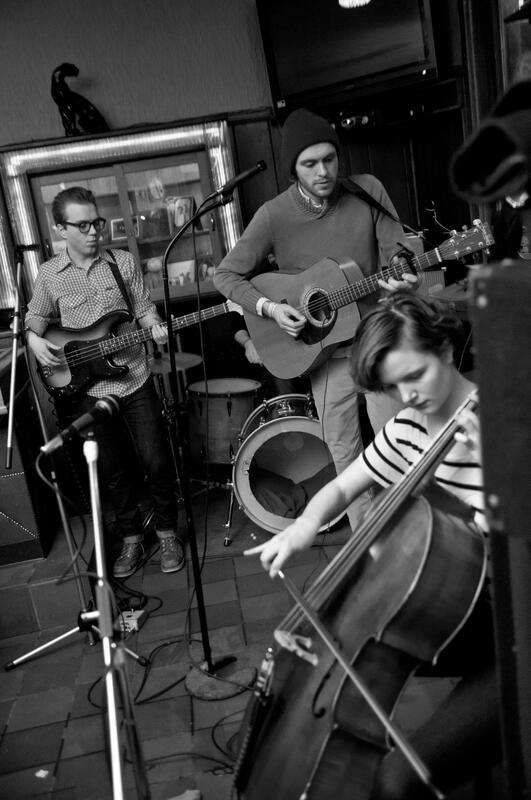 Pioneer, a folk rock quartet with haunting melodies and lilting harmonies, will kick off the 2012 DubuqueFest Fine Arts Festival, performing on the Town Clock Main Stage on Friday, May 18 at 5 p.m. 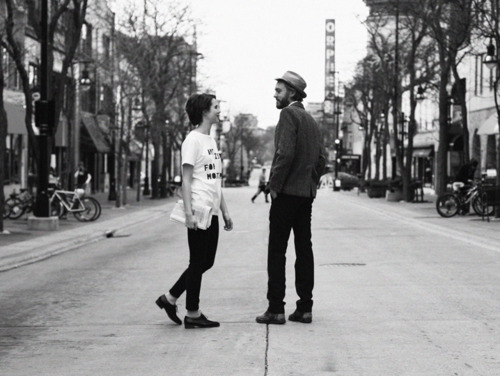 The Madison-based group will perform original music written by acoustic guitarist and songwriter Kenny Monroe, featuring the cello and vocals of classically-trained cellist Jacqueline Kursel, drums and percussion by Shawn Pierce, and the bass guitar and vocals of Tyler Ditter. The folk-inspired music of Pioneer, interwoven with intricate guitar, cello and bass, and precise drum work, tells stories of love, loss, memory and Midwestern people and places. 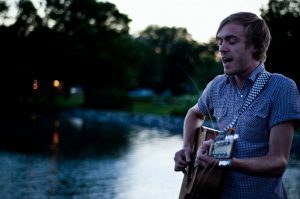 Kenny says, “I grew up near upper Michigan and was familiar from a young age with the vibrant lower Michigan folk scene, which to this day remains my biggest influence.” After moving to Madison in 2007, Kenny met Tyler and Shawn, who would eventually become the Pioneer bassist and drummer. 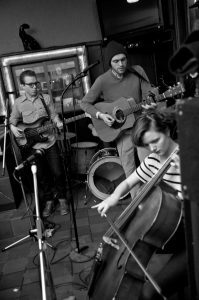 The idea of integrating a cello into the band was modeled after the instrumentation of Michigan songwriter Matt Jones, whom Kenny calls, “my favorite song writer of all time. He’s why I wanted to start playing seriously.” The band known as Pioneer really took off once he met Jacqueline. Their 4-track demo album, available at www.pioneer.bandcamp.com, was created from filmed live performances. “The song ‘Memorial Day’ – I wrote that song when I was visiting my home town in northern Wisconsin on Memorial Day weekend. There’s a little bit about the general sense that you get in rural places that there’s a lack of economic opportunity.” Pioneer is also polishing a studio album with psychedelic overtones and what Kenny calls “weirder instruments.” Their DubuqueFest performance will include songs from both albums, in addition to a few Neil Young covers. His song lyrics are “ambiguous, can mean different things, depending on what part of the song you listen to, or what sticks out to you personally. I try to approach it from a way where I bring in some personal things, love and loss.” The cello fits naturally within the mix, adding its elongated tones to the folk-driven melodies. Pioneer’s 5 p.m. kickoff performance on Friday May 18, 2012 on the Town Clock Main Stage will be followed by a spectacular slate of four performances on two stages, for a nonstop musical experience. JJ Schmitz Experience will perform at 6:15; White Mystery at 7 p.m.; Ida Jo & the Show at 7:45 p.m.; and topping off the evening, headliner Andy Frasco and the UN will take the stage at 8:15 p.m. The festival will continue with more music on Saturday. For complete details, see the DubuqueFest Music Schedule, or for the most current news, “like” the DubuqueFest Facebook page.